Given the intense rivalries that often exist in the restaurant world, it’s refreshing to see teamwork has come into vogue among our city’s top chefs. Recently, we’ve seen enough multi-chef dinners, pop-up invitationals, and special-guest prix fixe’s to makes us wonder if L.A.’s dining world has struck some sort of truce. That said, we sure do miss a good old fashion chef throwdown á la Iron Chef. 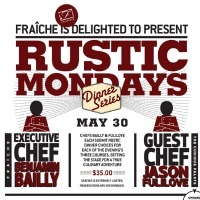 The next best thing, given today’s hospitable climate, may be Fraiche’s Rustic Monday dinners, which enters it’s second round on May 30. Though it’s all in our heads, we relish the idea of an intense culinary battle between Fraiche’s Benjamin Bailey and The Curious Palate’s Jason Fullilove. Instead, The two young chefs will be working side-by-side serving their interpretations of a “rustic dinner” at Culver City’s Fraiche. Each chef will prepare a three-course meal from which diners can pick and choose items. Bailey will be creating a classic Provençale menu featuring asparagus blanc manger and beef stew, while Fullilove will be serving cured mackrel and a modern bouillabaisse. The last Rustic Monday featured Peruvian heavyweight Ricardo Zarate slinging his famous ceviche mixto. Here’s hoping this round gets a bit more heated. (Puff pastry food fight?) Tickets are $35 and seating is limited, so reservations are recommended.